Includes high voltage integrated circuit (HVIC) technology. 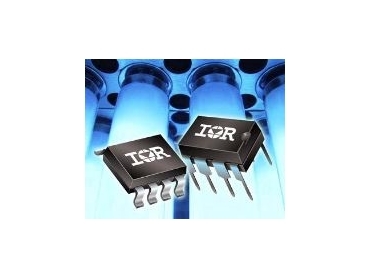 INTERNATIONAL Rectifier(IR) has introduced an electronic ballast IC for fluorescent lamps, the IRS2153D. The new 600V self-oscillating half-bridge IC includes an internal bootstrap diode to simplify circuits. The IC is designed to increase efficiency and performance over older, less efficient self-oscillating bipolar transistor-based solutions. The IRS2153D has an oscillator frequency precision of 3%, which helps to optimise external component selection for uniform lamp brightness during manufacturing. A preheat feature, which sets the correct preheat frequency for the correct duration and helping to maximise lamp life, can be realised externally. The IC is lead-free (PbF) and includes a 2V under-voltage lockout hysteresis for more robust ballast circuits and prevents unwanted shutdown if momentary transients occur. The IRS2153D includes an under-voltage lockout circuit that ensures the high-side floating voltage (VBS) correctly switches the high-side gate driver output (HO), protecting the external MOSFET. The device is based on the very popular IR2153x product family that integrates a ‘555’ type oscillator circuit with a 600V half-bridge gate driver to drive two output FETs or IGBTs. The IRS2153D is made with IR’s proprietary high voltage integrated circuit (HVIC) technology, which is ideal for designing products to drive MOSFETs and IGBTs. Gate drive outputs are designed using a latch-immune CMOS circuit. The technology integrates a low-voltage driver with a high-voltage level shifter for high-side and low-side gate drivers in one monolithic IC.